I’m an introverted person. That means, on an extremely simple level, that I need some alone time. At the end of a long day of work, I find myself wanting nothing more than to hide in my basement, turn on the PlayStation 3, and lose myself in the worlds of video games. I use this time to recharge and unwind, to give my mind a break from the constant push and pull of work and socializing. To be frank, I just want to be alone. Anyone who wants to read without being uninterrupted knows this feeling. Or who wants to be alone with the television to watch a favorite show or movie. But in today’s society, where cell phones keep our friends at our fingertips, finding this coveted alone time can be all but impossible. I may not be the most social person, but even still, my phone still constantly lights up with text messages, Facebook notifications, new tweets, and so on. And for a grand majority of the day, I am more than happy with this. I love seeing that someone saw a post I made and clicked “like,” or that someone on Twitter included me in a conversation. These things make me smile. Wait–How many people liked that cat video? However, at the end of the day, I just want to put my social media on hold and ignore the outside world for a while. I leave my phone in my bedroom and go to the basement, where for an hour or so, no one can get in touch with me. It sounds anti-social, and maybe it is, but it’s something I just need. For an hour or two, I just don’t want to talk to people. While I stuck to my guns and played my games, there was a nagging feeling in the back of my mind that I had disappointed my friend. I couldn’t shake it for the rest of the night, and even texted an apology/explanation after the fact, just explaining that it wasn’t that I was tired of him or bored or anything, just that I needed to be away from my phone for a while. I didn’t want to be rude and suddenly stop replying to messages. I don’t think I’m the only one who has dealt with this guilt. Anyone who has ever gotten a text message asking why they haven’t responded yet knows this feeling. You feel like someone has been waiting for you, someone cared enough to text you and you didn’t respond. And it’s not that I don’t care. It’s that I need a break from it all. WHERE THE @#$! ARE YOU? I think being constantly connected is great. But, for people like myself, there are times when we just want to turn off our phone and sever our connection to the outside world. I don’t think there’s anything wrong with that. Do you ever put your cell phone in another room specifically to ignore it? Have you ever felt guilty for not replying, or thought someone was mad at you when they didn’t respond? Note: Image of Surprised Girl Looking on Mobile courtesy of David Castillo Dominici / FreeDigitalPhotos.net. 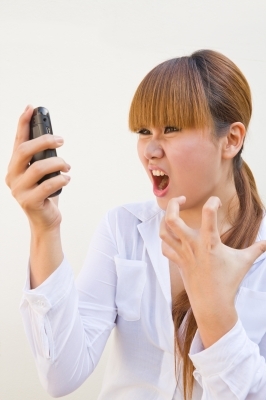 Image of Blonde Lady Screaming at Phone courtesy of mikumistock / FreeDigitalPhotos.net. Captions are by me. Your real friends know you and understand that you’re not blowing them off, so take that time for yourself and revel in it because that’s part of what keeps you sane. I separate work and personal time, so no push notifications from Facebook or Twitter, and while I have apps on my phone, I only check them when I take a break from work or I’m finished for the day. I feel about answering the phone or emails the same way I feel about answering the door: my home, my choice.